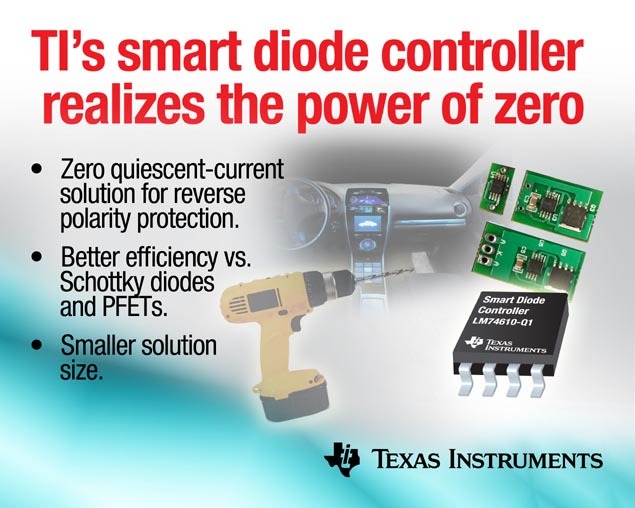 Texas Instruments (TI) introduced the industry's first smart diode controller with zero quiescent current that provides better efficiency versus Schottky diodes and p-channel MOSFETs. The LM74610-Q1 provides lower power consumption and heat in a compact solution size, making it well-suited for reverse polarity protection in high-current industrial power tool and automotive applications. The LM74610-Q1 features a unique floating ground architecture that models a diode behavior with zero ground current. Paired with TI's CSD17313Q2Q1 NexFET™ n-channel MOSFET, the duo emulates a diode rectifier when connected in series with a power source, discharging the MOSFET gate in the event of reverse polarity. The LM74610-Q1 can also be used to combine two alternate power sources in an ORing configuration to provide redundancy. Zero quiescent current eliminates battery drainage and extends battery life. External n-channel MOSFET enables a scalable solution for a variety of current levels. 45 V reverse voltage capability protects against automotive transients. AEC-Q100 qualified with 4 kV ESD protection for automotive applications. For automotive alternator and industrial power alternating current (AC) rectification, TI offers the LM74670-Q1 smart diode controller, which has higher gate drive current (70 µA) than the LM74610-Q1, allowing it to handle AC signals up to 300 Hz. The LM74610-Q1 Functional Block Diagram. Download the "System level reference design for 30-W ADAS system with required automotive protections" reference design of a multi-camera, surround view ADAS system with central processing. The design provides protection from reverse polarity and overvoltage using the LM74610-Q1 and 3-A LM53603-Q1 synchronous DC/DC converter, eliminating the need for a pre-boost during automotive start-stop and most cold crank conditions. with all required Automotive Protections – Board (Top view). Available in volume now from TI and its authorized distributors, the LM74610-Q1 is packaged in an 8-pin, 3-mm by 5-mm by 1.1-mm VSSOP package and priced at USin 1,000-unit quantities. Order an evaluation module for the LM74610-Q1.